If you maintain MySQL databases for a living, you know how important it is to be able to address and resolve issues quickly before the users come at you with pitchforks and torches! When people perform queries against your database, they expect quick, accurate results. The only way to stay ahead of the game is to monitor the performance of your MySQL database, and the best way to do this is with today's discount software promotion, Jet Profiler for MySQL! 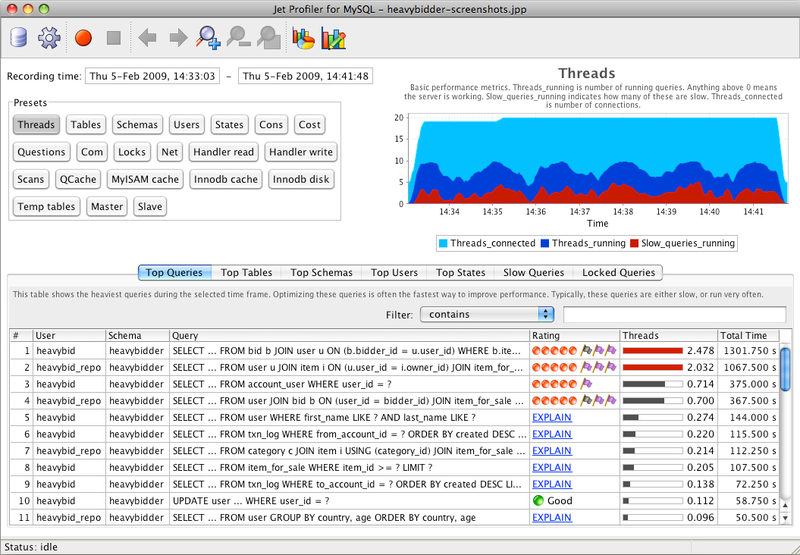 Jet Profiler for MySQL is a real-time query performance and diagnostics tool for the MySQL database server. With Jet Profiler for MySQL, you can measure and monitor query, table, and user performance, while enjoying graphic visualizations that save the headache of interpreting massive text-based reports and logs. At a glance, you'll know which are the most frequent queries, the most used tables, and the busiest users, allowing you to fashion a strategy that optimizes the database in the areas that people use the most. Administering a MySQL database is a breeze when you use Jet Profiler for MySQL. View all of your data in real time, in the form of diagrams, pie charts, and tables. Drill down to get to the nitty-gritty details if you need to. And enjoy all of it in a package that uses only 1% of your resources! After you purchase Jet Profiler for MySQL it may be used indefinitely. Jet Profiler for MySQL is licensed per user, so if more people are going to use Jet Profiler for MySQL you will need to purchase additional copies. Each license allows installation on 2 computers, but Jet Profiler for MySQL may not be used at exactly the same time on each of them. “Lancers is the top-line business leader in crowd-sourcing services in Japan. Our total contract price recently reached more than $53 million. However this exponential growth in service did lead to issues regarding the site’s performance. During our initial analysis, we found that the database system was causing a Bottleneck effect on the product. It was at this point that we introduced Jet Profiler. Once we had gone through the settings, it was super-simple to just wait for the server to send the required information. The data displayed was not only up-to-date, but also graphically clear enabling a quick diagnosis. Using this magnificent software, we were successful in detecting / improving the query that was the bottlenecking our service. We will continuously be recommending this marvellous product here in Japan.”- Kei Kinoshita, Senior Web Engineer, Lancers Inc.